In 1833, the First Universalist Society was organized at Fairhaven (now Childs) and a building committee consisting of John Proctor, Joseph Billings, and William W. Ruggles was selected. Built in the Federal style, the Universalist Church represents the oldest cobblestone church in North America. The building was constructed using fieldstones set in courses roughly 4 1/4″ high, with rough cut limestone quoins varying in size from 8″ x 14″ to 9″ x 23″. Bricks were used for lintels and the sills were fashioned from wood. Masons used the depressed hexagonal or “Gaines Pattern” of mortar embellishment. The first resident pastor arrived in 1834, ending the cycle of itinerant circuit preachers typical of the burned-over district. Rev. William Andrews’ stay with the congregation was short-lived, and he left the following year for a church in Buffalo. Over the next four decades, the church saw numerous preachers walk through the doors, only to leave shortly after. Due to the rapid succession of preachers, the congregation closed the building’s doors in 1865. The arrival of Rev. Nelson Snell in 1874 instilled a newfound zeal in the hearts and minds of the Fair Haven Society, which raised $1,000 to repair and remodel the building. During these renovations, the pulpit was moved to the north end of the sanctuary and placed on a newly constructed platform, the pews were turned to face north, and the old pew doors were removed. A mural was added behind the pulpit to give the effect of an out cove, and the white pews were repainted with faux wood grain. It is likely that during this time, the front brick and stone terrace was added. After the construction of the society’s new church in the Village of Albion in 1895, the cobblestone building was used two times per year for summer services and the basement was rented out to the Balcom brothers for cabbage storage. In the 1920s, the tower was in need of repair and the society elected to remove it instead. In 1960, the State Board of the Universalist Church declared the Childs church abandoned and had considered selling it. To avoid potential demolition by commercial interests, the Cobblestone Society Museum was formed and purchased the building. It was during this time, in the 1960s, that the museum carefully repaired and restored the interior and exterior. The roof was repaired, broken glass replaced, woodwork painted, plaster repaired, interior painted, the mural repaired, the terrace rebuilt, and a concrete basement floor added. In July of 1964, thanks to a generous donation from John Brush, the church’s tower was reconstructed and installed. The interior of the church is arranged to look as it would have in the 1880s. 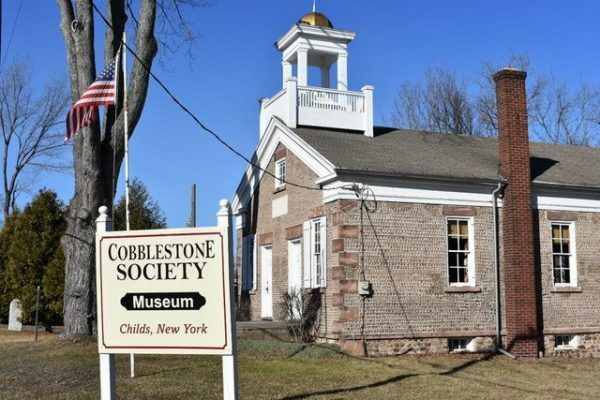 The Cobblestone Museum is an open-air museum that promotes the study and exploration of cobblestone construction methods from 1825 to 1860, offering visitors the opportunity to explore three period cobblestone structures set in Victorian appearance and four wood structures highlighting 19th century agricultural implements and skilled trades.